Xiao long bao, or little dragon dumplings (an unofficial reference), generally top anyone’s must-try in Taiwan food list. What sets these dumplings apart from other dumplings are the fact that their thin, tender skin encases a piping-hot filling containing meat, seafood or vegetables (sometimes all three) floating in tasty broth. This is where the name little dragon dumpling comes from, as wise diners pierce the dumpling skin (causing them to breathe steam like a dragon) prior to eating. When it comes to getting xiao long bao (soup dumplings) in Taiwan, Din Tai Fung (awarded one Michelin star by the 2010 Hong Kong and Macau Michelin Guide) is usually the first place that comes to mind. It should come as no surprise that not only does it top our list of best soup dumplings spots in Taiwan, but also that many of the other restaurants on the list will have their dumplings compared to those found here. One of the most popular Din Tai Fung branches among travelers is on the basement floor of the iconic Taipei 101, which boasts a large window separating diners from the kitchen, through which diners can watch a team of a dozen chefs as they go through the 18 delicate motions it takes to make each dumpling. Another popular branch (the first in Taipei) is on the corner of Yongkang street (Taipei’s gourmet ghetto) at the Dongmen MRT Station. Whichever you choose, you can enjoy the rich meat and seafood flavor alongside the savory broth in each dumpling. Don’t forget to dip your dumplings in dipping sauce made with fresh ginger, creating a perfect flavor mixture for Taiwan’s favorite soup dumplings. Though most Westerners think of loofah as something to shower with, the gourd is actually a very popular, tasty and nutritious vegetable found in dishes around Taiwan. 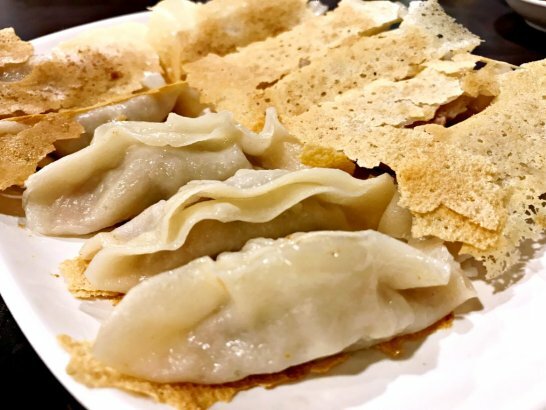 Many locals swear that the loofah dumplings at Sheng Yuan are better than those served by Din Tai Fung; one diner told us that the proportion of loofah and pork were more perfectly balanced. We recommend that you try the first bit of this dish plain, skipping both soy sauce and ginger, allowing you to experience the crispness of the loofah, the sweetness of the soup and the fresh, light taste of the pork broth in their natural form. Sheng Yuan’s baskets come with 8 dumplings each, and dumpling aficionados will note that the skins of these dumplings are slightly thicker than those of Din Tai Fung dumplings. Lines are generally short on weekdays, and serving time is fast. Sheng Yuan is quite popular with foreign students, as it is close to the National Taiwan Normal University (NTNU, which offers good Chinese language programs). Expect to wait a bit longer on the weekends. Another signature dish at Sheng Yuan. Taiwanese diners like to add vinegar or garlic to the dish, but you might like it plain. 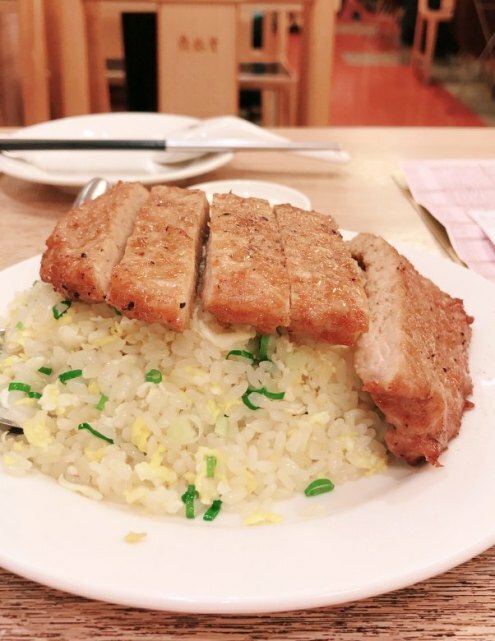 A quick walk from Sheng Yuan, Hang Zhou was awarded the Bib Gourmand distinction in the 2018 Taipei Michelin Guide, so you know it’s got to be good. 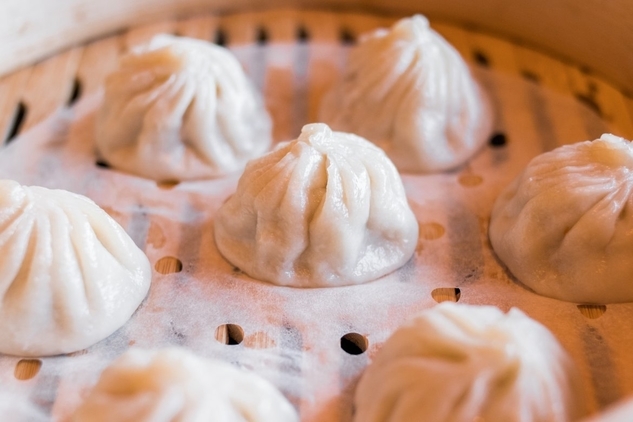 Situated right next to the Chiang Kai-shek Memorial Hall, Hang Zhou Xiao Long Bao is popular with locals and tourists alike. The dumplings here are heavy with filling, and thicker and a bit chewier than dumplings found at some of the other shops on this list. At NTD$110, the dish may seem a bit pricey, but trust us, it’s worth it. 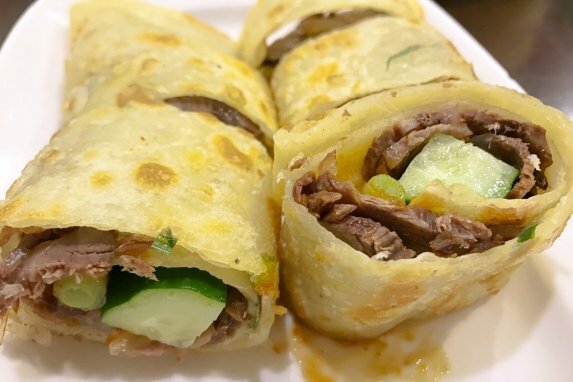 The delicious doughy skin wrapped around tender beef and crispy cucumbers and green onion is amazing. 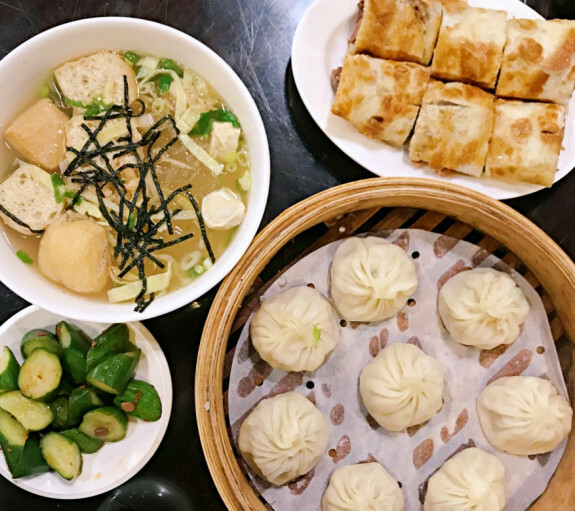 It’s love at first bite with Gao Ji’s dumpling, which is why this place gives even top-rated Din Tai Fung a run for its money. Eat these dumplings hot for the best texture, flavor, and aroma. Like some of the other dumplings on our list, Gao Ji offers a thicker, more chewy variety of soup dumplings. Their main store is on Yongkang street, right in Taipei’s gourmet ghetto and a quick walk from Din Tai Fung, so if you don’t feel like waiting on the line at DTF (average wait time of 50 minutes), this is the place to go for your soup dumpling fix. These traditional Shanghainese style fried pork buns are considered some of the best in Taipei. If you want to join locals looking for soup dumplings at a good price (and without the lines), head to Suhang Dessert Shop. Suhang’ssoup dumplings come in baskets of 8 for only NT$120 (USD$4), making them a good deal. The thick, savory broth spills out as you pierce the dumpling skin, bringing out the rich flavor and aroma of a peppery pork stuffing. 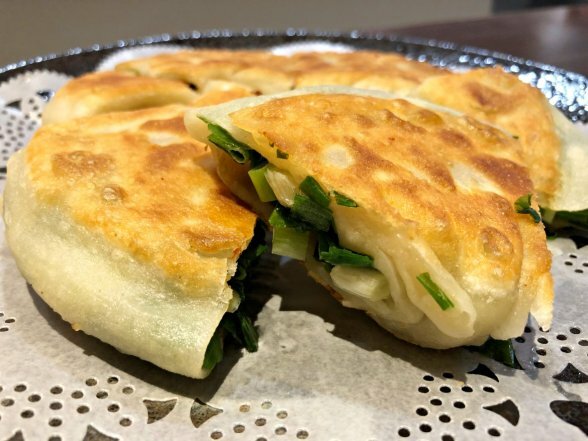 Though some find Suhang’s dumpling slightly more oily than those found in other dumpling shops, other diners really enjoy the flavor and texture. Xie ke huang is a crisp pastry browned on one side with sweet or salty stuffing and sesame seeds on the upper crust. Originally from Shanghai, this is probably Suhang’s most famous snack, with many customers buying dozens at a time. If you want to try one, we suggest going a bit earlier in the day before the shop sells out. Hao Gong Dao Jin Ji Yuan is another recipient of 2018’s Michelin’s “Bib Gourmand” distinction, so you know it’s got to be special. Entering the restaurant, the first thing you’ll see is the high stacks of bamboo steamers stacked up high by the entrance. Also on Yongkang street, you can fill up on dumplings at the Golden Rooster for about half the price of Din Tai Fung or Gao Ji (the phrase “good Justice” or 好公道 can also be interpreted as “just” as in “fair”). Their soup dumplings are 50% bigger than those found elsewhere and filled with thick broth, meat, and exquisite flavor. Definitely a just portion! Like Suhang Dessert Shop, Jin Ji Yuan is also famous for its puff pastries with many different fillings to choose from. Not sure which one to start with? You can’t go wrong with Jin Ji Yuan’s 重酥蔥餅 (onion cake). It’s pretty telling that even if you come to this restaurant on a Tuesday evening, you still have to queue up for a table. Jin Din Rou is especially popular among Japanese, both tourists and long-time Japanese expatriates living in Taiwan. (All of the Japanese-language travel guides recommended this restaurant.) Their signature dish is the Oolong tea xiao long bao, which features a skin infused with green tea powder and an oolong tea powder infused pork filling. It’s definitely a unique flavor! The skin of Jin din rou’s soup dumplings are thinner and closer in texture to those found at Din Tai Fung. Hot and sour soup is a common side dish for dumplings, and Jin Din Rou’s version stands out as some of the best in Taipei. They don’t use too much white pepper, giving the soup a fresher, tangier flavor. 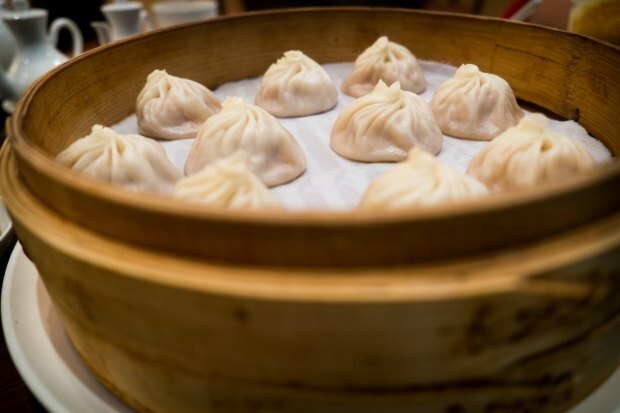 Written up in magazines and newspapers around Asia, it’s not surprising that Mingyue’s soup dumplings have been compared favorably with those found at Din Tai Fung since the restaurant was opened by one of Din Tai Fung’s former dumpling masters. Dumplings at Mingyue are affordable by comparison, and the flavor is also highly recommended by locals who say the thin skin and broth/meat combination is one of the best in Taipei. The steamed oil creates a fat-rich soup that balances perfectly with the dumplings, which are delicious without the addition of sauce. Deep fried dough filled with a mixture of pork, leeks and a tiny bit of fat makes Mingyue’s crispy potstickers both extremely delicious and quite popular among locals. Whereas Din Tai Fung’s xiao long bao are made with an 18-fold method, Dian Shui Lou goes one fold further with its 19-fold dumplings. 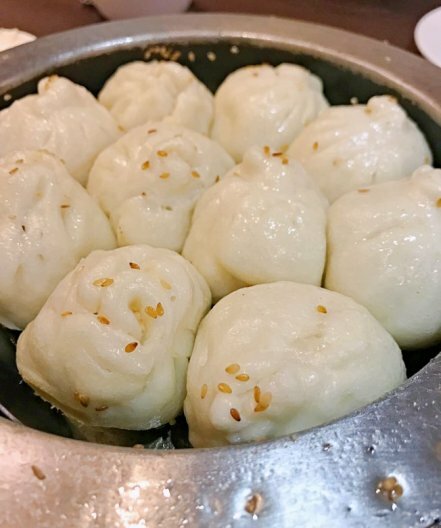 The most popular dish at Dian Shui Lou is their 7-color dumplings, which (strangely enough) contain eight different kinds of soup dumplings including loofah, spicy, XO sauce, crab roe, basil, garlic, and truffles. All are delicious. Our favorite is the basil xiao long bao, which has a strong basil flavor. Fans of spicy food won’t want to miss the XO sauce dumpling, made with a spicy seafood sauce. And of course, Dian Shui Lou’s Garlic dumplings are worth a try; though an important condiment in Chinese cuisine, having garlic as a dumpling filling is rather unique. Dian Shui Lou’s scallion cakes are thick and chewy, filled with juicy green onions (a specialty of nearby Yilan county). Last on our list is Wu Ma Hua, or “five flower horse. Though a chain dumpling place, Wu Ma Hua holds a special place in the hearts of many a long-time western expatriate in Taiwan, partially because one of their larger branches is conveniently located in the Tienmu neighborhood (AKA Taipei’s expat ghetto). While all of Wu Ma Hua’s dumplings are quite good, we especially like the ones with shrimp and scallops. Another fun part of dining at Wu Ma Hua is their sauce bar, which allows diners to combine all sorts of ingredients to make different combinations of dipping sauces. Wu Ma Hua’s radish cakes are really tasty and are a really good way to experiment with different sauce combinations from the dipping sauce bar.